Elevated levels of atmospheric carbon dioxide accelerate carbon cycling and soil carbon loss in forests, new research led by an Indiana University biologist has found. The new evidence supports an emerging view that although forests remove a substantial amount of carbon dioxide from the atmosphere, much of the carbon is being stored in living woody biomass rather than as dead organic matter in soils. Richard P. Phillips, lead author on the paper and an assistant professor of biology in the IU College of Arts and Sciences, said that after nearly two decades of research on forest ecosystem responses to global change, some of the uncertainty has been lifted about how forests are storing carbon in the wake of rising carbon dioxide levels. 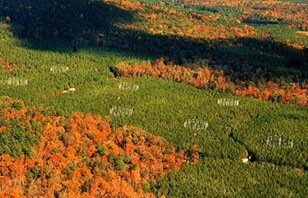 The research was conducted at the Duke Forest Free Air Carbon Dioxide Enrichment site in North Carolina, where mature loblolly pine trees were exposed to increased levels of carbon dioxide for 14 years, making it one of the longest-running carbon dioxide enrichment experiments in the world. “It’s been suggested that as trees take up more carbon dioxide from the atmosphere, a greater amount of carbon will go to roots and fungi to acquire nutrients, but our results show that little of this carbon accumulates in soil because the decomposition of root and fungal detritus is also increased,” he said. Carbon stored in soils, as opposed to in the wood of trees, is desirable from a management perspective in that soils are more stable over time, so carbon can be locked away for hundreds to thousands of years and not contribute to atmospheric carbon dioxide increases. The research was conducted at the Duke Forest Free Air Carbon Dioxide Enrichment site in North Carolina. At this site, mature loblolly pine trees were exposed to increased levels of carbon dioxide for 14 years, making it one of the longest-running carbon dioxide enrichment experiments in the world. Researchers were able to calculate the age of the carbon cycling through the soil by growing roots and fungi into mesh bags that contained uniquely labeled soils. The soils were then analyzed for their organic composition. The authors also report that nitrogen cycled faster in this forest as the demand for nutrients by trees and microbes became greater under elevated CO2. The two-fold effects of microbial priming, where microbes are stimulated to decompose old soil organic matter via an increase in new carbon and other energy sources, and the faster turnover of recently fixed root and fungal carbon, are enough to explain the rapid carbon and nitrogen cycling that is occurring at the Duke Forest FACE site. “We call it the RAMP hypothesis — Rhizo-Accelerated Mineralization and Priming — and it states that root-induced changes in the rates of microbial processing of carbon and nitrogen are key mediators of long-term ecosystem responses to global change,” Phillips added. “Most ecosystem models have limited representations of roots, and none of them include processes such as priming. Our results demonstrate that interactions between roots and soil microbes play an underappreciated role in determining how much carbon is stored and how fast nitrogen is cycled. So including these processes in models should lead to improved projections of long-term carbon storage in forests in response to global environmental change'” he said. “Roots and fungi accelerate carbon and nitrogen cycling in forests exposed to elevated CO2” — by Phillips; IU and University of Gottingen (Germany) post-doctoral researcher Ina C. Meier; Emily S. Bernhardt of Duke University, A. Stuart Grandy and Kyle Wickings of the University of New Hampshire; and Adrien C. Finzi of Boston University — was published July 9 in the online early addition of Ecology Letters. Free access to the research article will be available until October. Funding for this work was provided by the U.S. Department of Agriculture and the U.S. Department of Energy. Phillips and his research team in March received a $398,000 National Science Foundation grant to fund testing of the RAMP hypothesis in mixed hardwood forests of Indiana.